Frederic Sterling Lee passed away on October 23, 2014, just one month before his 65th birthday, after a brave battle against cancer. He was diagnosed with stage four lung cancer at the end of February. He, however, never stopped working for his students and for the community of heterodox economists until the end of his life, as he always did over the past 30 years of his academic career. 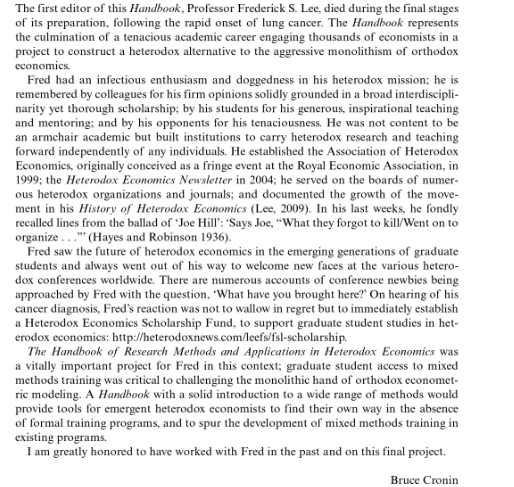 The entire community of heterodox economists across the world is saddened by the passing of Fred Lee. His contribution to heterodox economics and his influence on younger heterodox economists are enormous and invaluable. First of all, he will be remembered as the heterodox economist who endeavored to develop heterodox microeconomics that would completely replace neoclassical microeconomics. 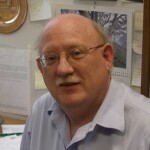 Through his magnum opus, Post Keynesian Price Theory (1998) he shows that the neoclassical price mechanism does not exist in the real world, and that there are alternative-heterodox theory of price and pricing which can be drawn from the work of Gardiner C. Means, Michal Kalecki, and P.W.S Andrews and Oxford Economists’ Research Group. This means that the entire neoclassical microeconomic framework is incoherent and irrelevant and, hence, a new theoretical framework that explains how the capitalist economic system (or the social provisioning process) works needs to be developed. He was working on this grand project toward the end of his life. He will also be remembered as a tireless organizer and institution builder who established the Association for Heterodox Economics (1999) and the Heterodox Economics Newsletter (2004). He also served a number of heterodox economics organizations and journals, including the editorship of the American Journal of Economics and Sociology (2009-2013). He believed that institution building is as important as theory building insofar as we are concerned with the continuation and reproduction of heterodox economics. 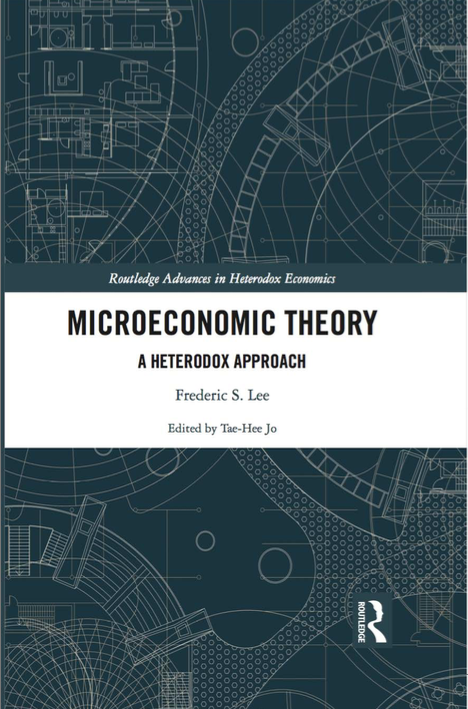 Fred Lee’s commitment to heterodox economics is also demonstrated by his book, A History of Heterodox Economics: Challenging the Mainstream in the Twentieth Century (Routledge, 2009). 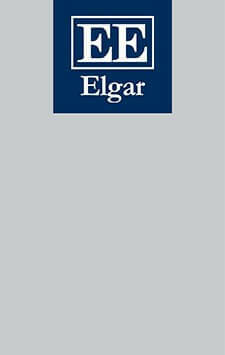 This is the only book ever published that deals with the institutional history of heterodox economics from 1900 to 2006 in the US and UK. More importantly, the objective of the book is to show that not only heterodox economics did/does exist, but also it can continue only if heterodox economists develop alternative theories and build institutions in the face of the dominance of mainstream economics. In fact, it took over ten years for him to complete this book. Once I asked him why he spent so much time to write this history book and then he said: “Because someone had to do it.” I now understand that it is not just someone, but someone who has a clear vision, unflagging energy, and willingness to sacrifice oneself for a better future of heterodox economics. Lastly, he will be remembered as an inspirational teacher and wonderful mentor who taught students how to do heterodox economics in a pluralistic, realistic, and integrative manner, and who cared about his students from the bottom of his heart. Although he did not have many students who wrote a PhD dissertation under his supervision, there are lots of young heterodox economists who are largely influenced by his work. 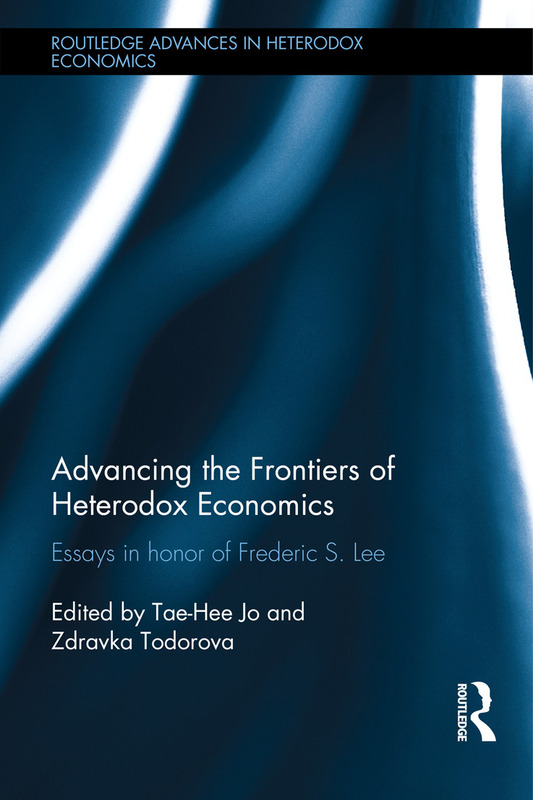 This is evidenced by all the messages collected after his passing (see here) as well as a forthcoming festschrift, Advancing the Frontiers of Heterodox Economics: Essays in Honor of Frederic S. Lee (Routledge, 2015). Right after he was told that he got terminal lung cancer, the first thing he told me was: “We need to establish a fund that helps heterodox doctoral students in heterodox doctoral programs.” As many of us remember, this is Fred Lee, the person who always cared about young heterodox economists—that is, the future of heterodox economics. The 2015 Solidarity Forever Labor History Calendar is now available. It features Joe Hill. If you do not know who Joe Hill is, I suggest that you do a little bit of work and find out or better yet hum to yourself, “Would you have freedom from wage slavery, …” And if you think you know something about the 1% versus the 99% and do not know who Joe Hill is then I suggest checking out the song “Preacher and the Slave” on the internet or some other strange contraption that did not exist in 1911. In the inside back page you will find a picture of myself with Joe Hill’s ashes—this is about as close as you will get to any real hero of the working class whose life was indeed put on the line—he was executed by the capitalists in 1915. You either walk the walk or you do not; and my career (along with my colleagues from around the world) has indeed walked the walk to ensure that heterodox programs exist and heterodox economists have jobs. And this has meant significant hardships for students and colleagues (not to mention loss of employment–see “A History of Heterodox Economics”) to critically study the mainstream theory that calls into question the argument that supports the 1%. And it also means that you have to go beyond the critical and develop an alternative that draws upon the different heterodox approaches. Through the Heterodox Economics Association Booth at the ASSA 2015, 60 Joe Hill calendars will be provided free to anyone. In return, all that is asked is that you look at the literature in the booth, in particular the scholarship material for graduate students. It is not cheap to go to graduate school; and at times it appears that those who have obtained their PhD have no interest in helping those who would like to get a PhD–in this case, they are certainly not walking the walk nor caring about the community of heterodox economists in which they operate. Do something–give a damn. For more information about the Joe Hill calendar go to http://iwwhlf.org; http://www.joehill100.com. Information about the Frederic S. Lee Heterodox Economics Scholarship Fund can be found at: http://heterodoxnews.com/leefs/fsl-scholarship. Fred Lee is survived by his wife, Ruth, their daughter, Sally, and two granddaughters. A memorial service for Fred Lee will be held Saturday, November 8th, 1:00pm at the Ethical Society of St. Louis, 9001 Clayton Road, St. Louis, Missouri. His ashes will be scattered at a later date at the Haymarket Martyrs Monument in Chicago, IL. 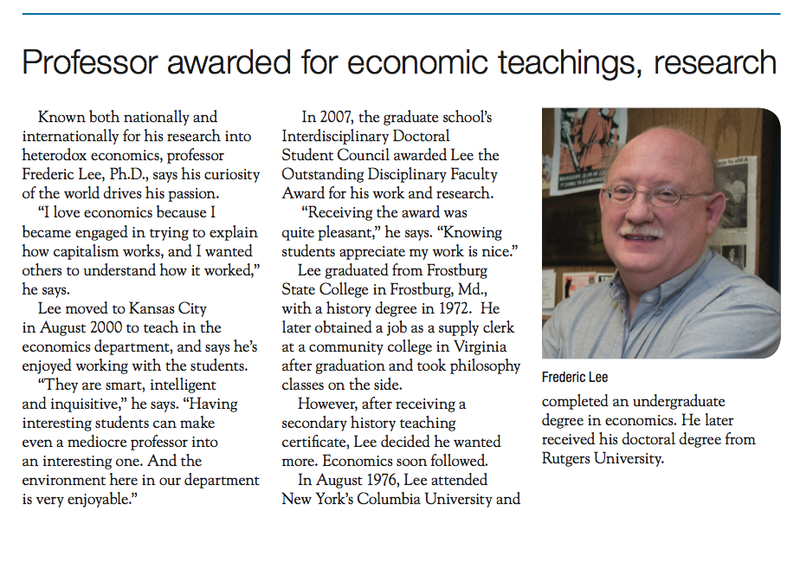 Condolences may be sent via Fred Lee’s website at http://heterodoxnews.com/leefs and memorial contributions can be made to the Frederic S. Lee Heterodox Economics Scholarship Fund which is housed at the Kansas City Community Foundation. Donations can be made at https://gkccfonlinedonations.org/give/leeh00.asp. Below are messages sent to AFEE, AFIT, ASE, AHE, PKSG, URPE, HES, IAFFE mailing lists, personal responses to John Henry and Tae-Hee Jo, and blog posts. (Last updated November 22, 8:00 pm). Today we remember the life of a great teacher, scholar, and rabble-rouser – Professor Frederic S. Lee (1949-2014). His life and accomplishments inspire us to strive to live up to the example he set for us. Each time he stepped into the classroom, Prof. Lee brought a fiery passion to his teaching. In an era of hyper-specialization, he drew on his immense knowledge of heterodox economics to connect with students, no matter what their interest. We knew that Prof. Lee’s door was always open to students. He would happily spend hours helping us develop our research and ourselves. Even when we weren’t always confident in our own theories, Prof. Lee believed in us. Prof. Lee’s steadfast commitment to intellectual pluralism stood as an inspiration for all who met him. As a scholar, he engaged with a wide range of alternative approaches to economics. He went even further with his commitment to interdisciplinary scholarship. Prof. Lee encouraged students and colleagues alike to learn the traditions and methods of other disciplines in order to create better explanations for how the world really works. Through his own interdisciplinary work, he played a critical role in the establishment of heterodox economics qua theory. As an organizer, Prof. Lee put his theories into practice by advocating for social justice. Economists around the world remember him for his legacy of building an inclusive community of researchers and activists. He never wanted us to separate ourselves from the real world, becoming cloistered in the ivory towers of academia. To the very end, his dedication to social justice burned like a torch in the night, guiding our path forward. At the 2014 Interdisciplinary Conference, he called on us to fight for justice and solidarity. Although our hearts ache with loss, we will celebrate his life by answering that call. World Economics Association Newsletter. November 3. Fred will be sadly missed. The students eligible for assistance must be enrolled in a doctoral heterodox economics program and demonstrate financial need. Students who have only partial scholarship support and need additional support to continue in their heterodox doctoral program. Scholarships will be awarded prior to the fall and spring semesters on an annual basis. The Fund will not provide scholarship aid for dissertation credit hours or for credit hours that are not directly relevant for the completion of the doctoral program’s course work. Varies. Tuition and fees for up to three classes per semester. Your contribution to honor the work of Frederic Lee and to support the education of doctoral students is appreciated. Contribute to the Fund here.